I was in town to witness and translate the opening process connection session with the resident Guelph Shebang Artists, who are preparing for their production as part of Culture Days at the River Run Centre, which runs from 3pm-5pm this Saturday, September 26th. What a warm welcome we received and what a beautiful space. I lugged armfuls of equipment into the Co-operators theatre – and was awed by the size of the room. Andrea laid out 10 mats in a circle in the middle of the large floor, in preparation for the arrival of the artists and others involved in the creation and production of the event. After the “Meet and Greet” of the group, which included dancers Meg and Ishra, musicians Amadeo and Bry, video artist Jenn, and writer Clair, and Erin, a documentary filmmaker here to record the process of the event, Andrea quietly explained how the week would proceed. This small intimate group have been working together for several years and the culmination of their collaborations is this week. The pathways of working with each have been laid down in the process workshops they have participated in, but due to schedules and other commitments, this morning was to be the only time the artists were all going to be together at the same time until the Dress Rehearsal Friday. It was important for the company to connect as a group one more time. Andrea offered a guided warm-up where they revisited experiences of past workshops to bodily anchor the Shebang experience and take this practice of embodied moving, knowing and, learning into their lives after the Shebang. Andrea uses a somatic approach to tuning and awakening each of the layers of the artists physical beingness. It is this process that allows for easy collaboration and generosity of spirit underlying the Whole Shebang experience. There is a willingness to participate and accept others where they are as they are. Kinesthetic awareness in the group by finding stillness and stir, facilitated feeling connected to one another. linking Touching back to back creating dyads of material connections and moving the dyads to connecting via hands and as a whole group for the rhythm of a heartbeat around the group. This process of embodied connection to self, and meeting and blending with other was evident in the collaborative works. Jenn Norton’s work Arm’s Reach was scored by Bry Webb. There is a mesmerizing quality that is translated to the viewer reclining in bean bag chairs, I was transported to an altered state. Although not there for rehearsal, Amadeo was present in Ishra’s fluid undulating sensual spiraling movement. Her interpretation of his music has a cellular consciousness to it and this must arise from their moving connections with one another. There is a mature sensitivity and authenticity to this collaboration. The brainstorming of ideas between dancers Meg and Katie and Interstitial artist Janet Morton about how to make the work interactive was another indication of the care the artists have for each other. There is an awareness and maturity and to the collaborations. There was no ego in the place, only respect for the individual artist and the curiosity of how the works speak to one another. This group processing through somatic experiences has influenced the way they work and interact. 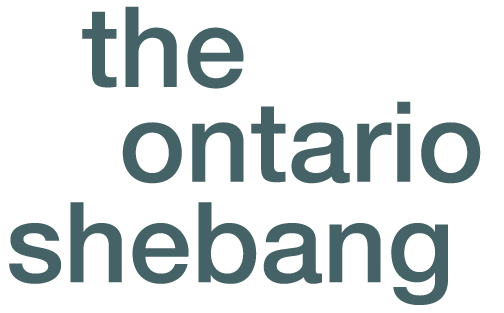 As mentioned the Guelph Shebang group is small, intimate, and more introverted. People tended to participate and then move off to process or rehearse their work. The other collaborators and equally important for the well being of the production and relationship with Shebang, were staff at the River Run Centre, the liaisons and technicians. They were available, informative, and creative in the way they brainstormed and problem-solved any performance production questions. Willing and accommodating this Shebang experience seemed an ideal artistic, technical, and community collaboration.